Black and white press photograph of the police raid at the Casa d'Italia building in Montreal, QC. 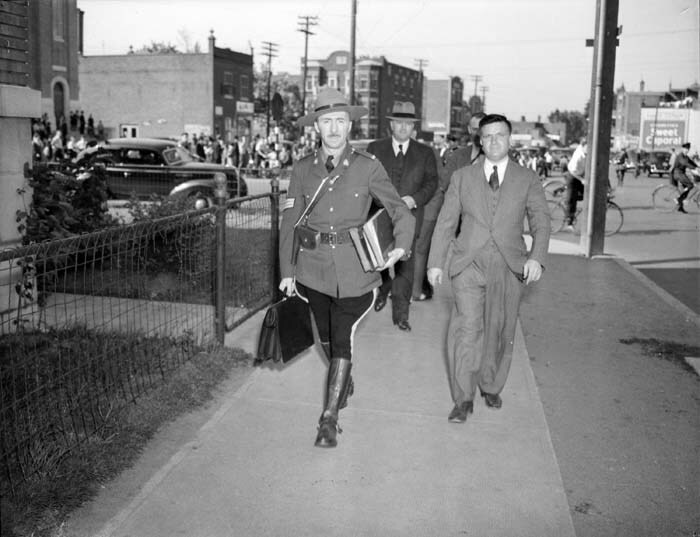 The photograph shows an Royal Canadian Mounted Police (RCMP) officer walking with a group of men in suits outside of the Casa d'Italia building. The man in the three piece suit walking on the right is likely Antonio Dieni, who was arrested on June 10, 1940. The RCMP officer is holding documents and carrying a briefcase of confiscated materials. Crowds of people can be seen in the background.